These beautiful cup-shaped, upright trumpets that are about 4" tall and 2" across on plants that grow about 18" - 24" tall with attractive broad, sword-like green foliage. They prefer full sun but will tolerate partial shade. 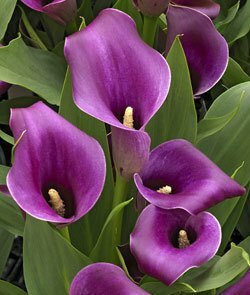 Calla Lilies are natives of South Africa, and can remain in the ground in zones 8-11, but cooler zones should dig the bulbs in the fall, store inside for the winter and replant in the spring. Calla lilies are great for beds, borders, patio pots or planters, as well as indoor house plants.